One of the core tenants of deliberative theory is that every individual has agency and we each have a moral responsibility to respect, support, and meaningfully engage with ourselves and others as agents in the world. Dewey seems to prefer to imbue the “democracy” portion of “deliberative democracy” with this power: when he argues that “democracy is a way of life,” he means that “democracy” is a metaphysical orientation which pervades the very ways in which we act and interact in the world. An orientation dedicated, roughly, to the belief that all people are equal and should share an equal role in co-creating the world. While I’m not entirely sure I disagree with Dewey here, I am generally inclined to think instead of “deliberation as a way of life.” Dewey is right that democracy isn’t merely a system of government, yet the word does imply certain instrumental and institutional norms — eg, not only recognizing every person’s voice, but some process of giving every person a vote. Democracy ensures that deliberation is not simply performative, that each person’s voice equates to some measure of power. This is certainly appropriate as a societal approach, but the challenge in trying to “live democratically” is that many sites of daily life do not (and, arguably, should not) afford equal power to individual participants. There are good and important arguments to be had about whether this is appropriate or not, but the widespread assumption is that children, students, employees, and others in hierarchal systems should not expect to be afforded the power of citizens in a democracy. Perhaps we ought to seek to push the bounds of democracy into all these spaces — I would certainly agree that many are less democratic than they ought to be — but I would broadly be inclined to argue that democracy is not appropriate under all circumstances and we would be wise to treat it as such. If the building is on fire, I don’t want to take a vote before someone decides to pull the fire alarm. All of this is to say that while “democracy” makes normative claims about the way decisions ought to be made, “deliberation” makes claims about the normative interaction of epistemic relations. That is – deliberation is fundamentally about the thoughtful and thorough exploration of knowledge, with the explicit assumption that we each not only have access to different knowledge but that we build and interpret knowledge in different ways. These concepts, of course, go closely together — as, indeed, the phrase “deliberative democracy” would suggest. The Good Society ought to give all members power in making those decisions (ie, democracy), but members of The Good Society ought to interrogate their own and others views, seeking as much understanding as possible (ie, deliberation). My concern about “living democratically,” then, is there are too many places at which a person may be inclined to cut corners — perhaps a toddler should not get to decide what they’re going to have for dinner each night. But while a reasoned person could certainly make an argument to that effect, making any exceptions quickly becomes a difficult slope — if there are, indeed, some circumstances under which democracy is not appropriate, how does one arbitrate those circumstances? My answer here is, of course, deliberation — we ought to talk and discuss and argue about these questions. But this also makes “living deliberatively,” as it were, a more powerful mode of interacting with the world. Taking deliberation as way of life means accepting that there are settings which are hierarchal, where some people have more decision making power than others. But it also means accepting, in a deep and meaningful way, that everyone brings value to the process, that every voice and perspective is desperately needed; that we all have agency regardless of how decisions are ultimately made. This in turn creates a set of obligations – to share your voice, to listen to the perspectives of others, to fight for everyone’s voice to be heard; to recognize yourself and others as agents in the world. I’ve been thinking about this a lot recently in terms of my pedagogical approach. My classroom is certainly not a democracy — and I’m not convinced that it ought to be — but my teaching style is decidedly deliberative. I want to know what my students think, I want them to tell me what works and what doesn’t work, I want them to argue against me, and to make suggestions for how they would like to see things done. I like to share my pedagogical reasoning – to explain what types of learning styles a given approach is aiming to support; to ask whether my approach seems to meet that goal and whether there are other learning styles which need to be supported differently. As an instructor, these are my decisions to make, but they are not decisions I can or should make on my own. My classroom may not be a democracy, but my students are agents of their own learning and it’s important that they be treated as such. This entry was posted in Citizens & Civil Society, Civic Studies on February 22, 2019 by sshugars. There is no shortage of pithy, pseudo-inspirational, questionably attributed social justice quotes. 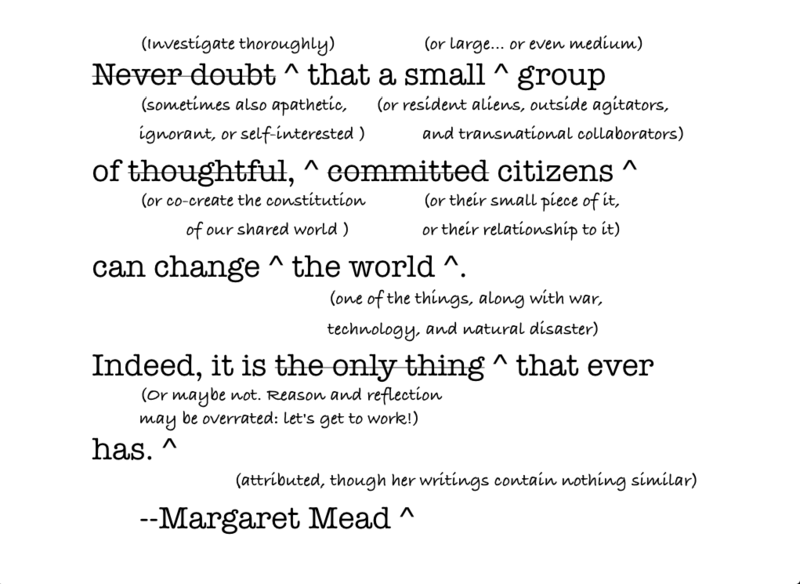 Margaret Mead’s apocryphal “Never doubt that a small group of thoughtful, committed citizens can change the world. Indeed, it’s the only thing that ever has” is a favored target among friends of mine, complete with a compilation of suggestions for making the expression more accurate. It’s the kind of thing I like to glibly quip in lieu of a well-placed do it yourself. This is in line with how the phrase is commonly interpreted: if you want to seechange in the world, you have to bethe change: you have to engage in the work and make the change happen. It’s this DIY spirit that makes “be the change” a favored expression among service organizations. Of course, there’s no evidence that Gandhi ever said this. If we could change ourselves, the tendencies in the world would also change. As a man changes his own nature, so does the attitude of the world change towards him….We need not wait to see what others do. This suggests a more quixotic vision — it’s not just about doing the work, it’s about fundamentally reorienting your relationship to the world in order to force the world to fundamentally reorient its relationship to you. In the Salt March, for example, Gandhi used the traditional practice of producing salt from saltwater to protest British regulation and monopolization of salt production. It was more than civil disobedience — it was an act intentionally designed bring the world the protestors wanted to life. “Be the change,” then, is more than a call to service or an admonition to do the work. It is a challenge to unapologetically interact with the world as if it were the world you would have it be: to normalize realities by treating them as normal, to relentless tilt at windmills until the world accepts the truths you see. There is something lovely in this sentiment, something inspirational in this vision of living in the world you want to live in, of building a better world by modeling a better world. Yet, as with many things — reality is far more complicated, and we would be wise to critically interpret Gandhi in the context of his broader personal and philosophical approach. While I would certainly be remiss to point to Gandhi’s words without acknowledging his deep anti-black racism and concerning sexual interest in young girls — the core commitment to non-violence for which Gandhi is so lauded is arguably problematic in its own right. Indeed, it’s something of an understatement to say that Gandhi believed in non-violence. Rather, he believed in the transcendence of unshakeable virtue; that pureness of body and spirit could confront the most vile of evils; that suffering voluntarily brings such an inner strength as to provide the greatest thanksgiving, joy and deliverance — no matter what the cost. So you can see, perhaps, why I would argue that Gandhi’s commitment to satyagraha went too far and even represents a moral failing when taken to its extremes. …one of the best defences against snake-bite is to have only as much as we need of wholesome food…to avoid anger and fear and, even when bitten by a snake, not to fall dead with fear before even a remedy has been tried. One should have confidence in the potent effect of the purity of one’s life and ultimately take courage in the thought that the length of one’s days is that ordained by God. If only we could “rid ourselves of all enmity towards any living creatures, the latter also cease to regard us with hate,” Gandhi argues. But regardless of whether I love or hate a snake — it may still bite. Ultimately, though, the interpretation of “be the change you wish to see in the world” comes down to a question of power. Power isn’t just about about the ability to control or coerce others, it is, in a sense, more fundamentally about the ability to control reality – to control the topics which get covered, the questions that get asked, and the perspectives that are considered. Power determines the bounds of normal and the imagination of what is possible. Power permeates our lived experience. What’s inspirational about “be the change” is that it serves as a reminder that you have power, that your mere existence provides a pathway for shaping our shared experience of reality. “Be the change” is a proclamation that only you get to decide the kind of person you will be in this world; you get to decide what kind of world will be built from having a person like you in it. The trouble is — there are far too many people who don’t get to decide. There are far too many people whose mere existence is under attack, who are met with hate and fear and violence just for the radical act of existing in this world. “Be the change,” then, is perhaps better interpreted as a statement of privilege; a commitment to allyship. It is not enough to talk about making the world more just or more equitable; it is not even enough to engage in “the work” — though that’s certainly an important step. No. If you have the privilege to be the change, if you have even a modicum of power over the tendencies of the world — then you hold that power in your every interaction, your every choice, your every experience. This entry was posted in Civic Studies on January 31, 2019 by sshugars. What: What are the specific actions to be taken? Should: What are the right actions and what are the right criteria for determining those actions? Do: It is not enough to determine the appropriate actions, we must actually take them. I like this question because it gives agency to both individuals and the communities to which they belong. As members of a society we should neither act with blind individualism – doing whatever we want whenever we want it – nor should we completely withdraw from public life, abdicating our responsibility to add our unique ideas and perspectives to the collective challenge of tackling complicated problems. We each have a responsibility to share our voices; to roll up our sleeves and engage in the work; but perhaps even more importantly – we have a responsibility to ensure that the voices of those around us are heard; to build spaces where everyone can participate. This duality is important because as individuals we play different roles in different contexts. As a first-generation-to-college woman in a STEM discipline, I’ve spent much of my life being told that my voice didn’t matter, that Ididn’t matter. Yet, as a highly educated white person, I still benefit from a lot of power and privilege. All of those identities are integral to who I am, and they each come into play in different settings – sometimes I need to be loud and vocal, and sometimes I’d do better to let others speak. At the end of the day, it isn’t about me – it’s about the strength of our collective endeavors. This essay is supposed present my personal philosophy of service. As you may have gathered by now, I have a hard time with that prompt. To me, the word “service” invokes images of parachuting in for short-term efforts – ideally under the auspices of someone from the community who actually knows what’s needed. There is nothing wrong with that type of service; it’s important work if done well. But I prefer Harry Boyte’s term “public work.” We are each members of many, overlapping communities and our collective work is needed to build and maintain those communities. It is “service” insofar as it is service to the collective good, but it is work– it is the time, energy, and thought that goes into co-creating our shared world. My personally philosophy, then is to perpetually ask, answer, and act on the question of “what should we do?” I put my energy towards building relationships of mutual trust, I put my time towards the collective work we agree must be done, and I put my financial resources towards causes I don’t personally have the expertise to support. I do my best to be a good citizen of my many communities – to listen, learn from, and support others while they listen, learn from, and support me. I try to build spaces where everyone knows they are welcome, where conflict doesn’t fester, and everyone accepts each other’s good intentions. To engage to the best of my ability in the unglamorous, every day tasks of associated life. This entry was posted in Civic Studies on June 13, 2018 by sshugars. Skeptics of the democratic ideal of self governance often point to the almost laughable impracticality of the vision. People are simply bad at being knowledgeable and making well-informed judgements. Notably, this concern needn’t inherently be a slight. While the most elitist of skeptics will judgmentally decry the dreadful specter of “the masses” for perceived failings of willful ignorance or stupidity, some scholars offer a more nuanced view. Consider, for example, the post-WWI writing of journalist Walter Lippmann. While his rhetorical flourishes reasonably earned him a reputation as an elitist and a technocrat, the full thread of his argument is much more subtle. But despite the colorful imagery, his argument wasn’t that the vast mass of men were too lazy or stupid to be entrusted with the vital task of democracy. Rather, his argument was simply that no single person could ever have the capacity to be all-knowledgeable on all things. There is just too much. Reasonably lacking in the time to perfectly master all of human knowledge, every single person is left to make the best decisions they can by drawing heavily from existing knowledge, perceptions, and instincts. Lippmann, incidentally, coined the word “stereotype” to describe the phenomenon. As social psychologists will tell you, “stereotyping” is not inherently bad. As beings constantly bombarded by information, we literally couldn’t function if we constantly had to reconstruct our basic understanding of everyday objects and encounters. We couldn’t live without heuristics. But, they can also become problematic if we become too rooted in our thinking, if we don’t have or take the time to periodically push past our heuristics. Political polarization is just one example of this. It is too easy, too easy, to heuristically label people who agree with you as “good” and people who disagree with you as “bad.” A mild version of this may be helpful in some cases of electoral politics – knowing that a candidate of party X supports the political platform I generally support is arguably meaningful information. But it most certainly becomes problematic when this heuristic labeling seeps into our every day life and every day encounters. Markus Prior argues that polarization is an outcome of an increasingly efficient media environment. When people aren’t all “accidentally” exposed to the same evening news – as they were when the evening news was literally the only thing on TV – people tend to self-select into separate, biased news spheres. Perhaps worse, they self-select out of news consumption all together. After all, there are far more enjoyable things to watch than the constant depressing drudgery of current events. This causes a perfect storm for polarization – most people are generally uniformed, and when they peak their head up to get a sense of what’s going on, they make quick judgements inferred from a media outlet specially curated to cater to their existing beliefs. There’s a reasonable amount of psychological and political literature to reinforce this story, but, I think, we lose something if we forget the Lippmann view. The problem, Lippmann would argue, is not the stereotypes themselves, it’s the thoughtless and broad application of them which results from not having enough time to do otherwise. In other words, while the wide variety of media options may lend themselves to polarization, the constant, 24-hour avalanche of news coverage is perhaps a bigger problem. It is literally impossible to keep up, to take it all in and study every issue in a thoughtful, non-biased way. In the absence of time for such activity, and buried in our own personal pressures of work of and life, we adapt as best we can by making quick, vaguely informed decisions motivated largely by our pre-existing beliefs. It’s not that “the public” can’t be trusted, Lippmann would argue, it’s that we all put too much faith in our own ability to rise above such challenges. It is always “other people” who are politically foolish. We – and the people we agree with – are, of course, more enlightened. As if anyone has the ability to keep up with all the news. This entry was posted in Civic Studies, Politics on October 31, 2017 by sshugars. A commonly lamented problem in machine learning is that algorithms are biased. This bias can come from different sources and be expressed in different ways, sometimes benignly and sometimes dramatically. I don’t disagree that there is bias in these algorithms, but I’m inclined to argue that in some senses, this is a feature rather than a bug. That is: all methodical choices are biased, all data are biased, and all models are wrong, strictly speaking. The problem of bias in research is not new, and the current wave of despair is simply a reframing of this problem with automated approaches as the culprit. To be clear, there are serious cases in which algorithmic biases have led to deeply problematic outcomes. For example, when a proprietary, black box algorithm regularly suggests stricter sentencing for black defendants and those suggestions are taken to be unbiased, informed wisdom – that is not something to be taken lightly. But what I appreciate about the bias of algorithmic methods is the visibility of their bias; that is – it gives us a starting point for questioning, and hopefully addressing, the inherent social biases. Biases that we might otherwise be blind to, given our own personal embedding in the social context. After all, strictly speaking, an algorithm isn’t biased; its human users are. Humans choose what information becomes recorded data and they choose which data to feed into an algorithm. Fundamentally, humans – both specific researchers and through the broader social context – chose what counts as information. As urban planner Bent Flyvbjerg writes: Power is knowledge. Those with power not only hold the potential for censorship, but they play a critical role in determining what counts as knowledge. In his ethnographic work in rural appalachia, John Gaventa similarly argues that a society’s power dynamics become so deeply entrenched that the people embedded in that society no longer recognize these power dynamics at all. They take for granted a shared version of fact and reality which is far from the unbiased Truth we might hope for – rather it is a reality shaped by the role of power itself. In some ways, algorithmic methods may exacerbate this problem – as algorithmic bias is applied to documents resulting from social bias – but a skepticism of automated approaches opens the door to deeper conversations about biases of all forms. Ted Underwood argues that computational algorithms need to be fundamentally understood as tools of philosophical discourse, as “a way of reasoning.” These algorithms, even something as seemingly benign as rank-ordered search results – deeply shape what information is available and how it is perceived. I’m inclined to agree with Underwood’s sentiment, but to expand his argument broadly to a diverse set of research methods. Good scientists question their own biases and they question the biases in their methods – whether those methods are computational or not. All methods have bias. All data are biased. Automated methods, with their black-box aesthetic and hopefully well-documented Git pages, may make it easier to do bad science, but for good scientists, they convincingly raise the specter of bias, implicit and explicit, in methods and data. And those are concerns all researchers should be thinking about. This entry was posted in Civic Studies, Computer Science on September 12, 2017 by sshugars. While there are differing views on whether or not a person’s opinions are likely to change, there’s a general sense of “opinion change” as some clear and discrete thing: one moment I think X, and the next moment I think Y…or perhaps, more conservatively, not X. Coming to opinion change from a deliberation background, I’m not at all convinced that this is the right framework to be thinking in. Perhaps in a debate the goal is to move your opponent from one discrete position to another, or to convincingly argue that your discrete position is better than another. But in deliberation – which very well may include aspects of debate – the very notion of “opinion change” seems misplaced. I think of deliberation more as process of collaborative storytelling: you don’t know the ending a priori. You create the ending, collectively and uniquely. A different group would tell a different story. As the story unfolds, you may shift your voice and alter your contributions, but the X -> Y model of “opinion change” doesn’t seem to fit at all. The challenge, perhaps, is that standard conceptions of opinion change take it as a zero-sum game. One person wins and another person loses. Or no one changes their mind and the whole conversation was a waste. But deliberation isn’t like that. It is creative and generative. It is a collective endeavor through which ideas are born, not a competitive setting with winners and losers. In deliberation, all participants leave changed from the experience. They come to think about things in new ways and have the opportunity to look at an issue from a new perspective. They may or may not leave with the same policy position they had going in, but either way, something subtle has changed. A change that may effect their future interactions and future judgements. Standard conceptions of “opinion change” as a toggle switch are just too narrow to capture the rich, transformative interplay of deliberation. This entry was posted in Civic Studies on September 8, 2017 by sshugars. There’s a long tradition in computer science, largely originating from cryptography, of designing with a generic adversary in mind. Code should be able to handle the mistaken input of a thoughtless user and should remain robust in worse-case scenarios. The motivation for this approach is simple: programming for ideal users and ideal cases will quickly go awry in the messy world of practical applications. Programming against a malicious or incompetent adversary will make your code better. This presents an interesting divergence from deliberative theory, where participants are arguably hoped to be as close to ideal as reasonably possible. If people can be thoughtful, open-minded, and eager to discover the truth through debate, then deliberation can be transformative. If they enter discussion as “tolerant gladiators,” to borrow a phrase from Huckfeldt, and argue with the goal of convincing others and being convinced when it is appropriate, as Mercier and Landemore write, then we can have a rich and robust society. Skeptics respond that this is too idealistic a vision. People are just not that virtuous and unbiased. At least, not in the numbers required for a functioning deliberative democracy. Deliberative democrats continually rebuff this claim. Mansbridge, for example, draws a distinction between adversary democracy and unitary democracy. Adversary democrats not only have hesitancies about the capacities of humankind, but more fundamentally, they believe political life can only exist as a zero-sum game. In every community decision, in every group interaction, someone wins and someone loses. With this epistemic frame, any shortcomings of humanity are actually besides the point: the best you can do is try to make the distribution of wins and loses as just as possible. Mansbridge and others strongly argue against this framing. Political life – associated living – is not zero-sum. By engaging in deliberation, by reasoning together, people can collectively build new approaches and solutions which remain out of reach in the adversarial paradigm. It is not about winning or losing; it is not even about compromise. Deliberation transforms the values and beliefs of participants and gives them space to co-create their worlds together. I believe whole heartedly in this vision. Politics isn’t zero-sum – or at least doesn’t have to be – and deliberation can serve as a powerful vehicle for collective leadership. But I am left wondering – do adversarial models have no place at all? This seems somewhat unlikely, given the current inundation of adversarial political relationships. Yet, the prevailing wisdom among deliberative democrats is that current democratic failings result primarily are primarily epistemic in nature – that if we collectively shift how we think about politics we can build the unitary systems Mansbridge describes. It seems, though, that the computer science model might have some value here. Imagine an adversary who is wholly uninterested in dialogue. Engaging them in deliberation is more challenging than overcoming their biases or social power, rather they actively engage in trying to make deliberation fail. There are a lot of great frameworks for deliberation, there’s a lot you can accomplish with structure and moderators. But if someone is deadset on being adversarial – if they actively don’t want to participate and threaten the wellbeing of other participants – I don’t see how deliberation can survive. That’s not necessarily fatal to deliberation, though – I still believe strongly in the critical role this work has to play in our democracy, and I would still fancy myself a deliberative democrat who sees this approach as the cornerstone for a healthy democracy. But sometimes you have adversaries who don’t want to play by the rules. Who don’t want to co-create or reason with others. They just want to destroy. And for that you need a whole other approach of advocacy, protest, and resistance. This entry was posted in Civic Studies, Politics on August 17, 2017 by sshugars. There’s a certain narrative about deliberative democrats which paints them as hopeless idealists. John Dewey is perhaps the quintessential example of this – he writes passionately about the “great community,” and was steadfast in his belief that humanity could and would achieve this sublime state. While broadly agreeing with critics such as Lippmann as to the modern problems of civil society, the optimism of Dewey’s solutions is notably divergent. The problem, he argued, was not that average people did not have the capacity to properly govern themselves, but rather that civic infrastructure did not fully allow them to exercise this capacity. Given robust civic education and institutions which genuinely encourage and incorporate citizen participation, humanity could achieve great things. In short, we have the capacity to self govern, we simply need to trust ourselves. In short, citizens engaging in meaningful debate about moral issues will eventually come to agree on what is right. The solution which emerges from such a process is intrinsically moral thanks to the collaborative filtering of discussants and it is bolstered by the rich process of debate which led to the consensus. The enthusiastic visions of Dewey, Habermas, and other pragmatists may be inspiring, but they rightfully earn a lot of skepticism. Is such ideal dialogue even possible? Perhaps our moral divisions are ultimately intractable. Most troubling to me are the concerns raised by Sanders, Frasier, and others. These visions of the Great Society, and the roadmap for how we get there do not give proper care to the role of power. In an imperialist white supremacist capitalist patriarchy – to borrow a phrase from bell hooks – it is not enough to encourage people to enter deliberation with an open mind. It is not enough to teach core civic values. The structural inequality of society will pervert deliberation amongst even well-meaning participants. Such false deliberation – which leaves those in power with a claim to moral consensus when none was achieved – is arguably even worse than a state with no deliberation and no appearance of legitimacy. Fraser builds off Habermas, arguing that these rich conversations don’t happen merely in a single, mainstream public sphere. Rather, the public sphere as we encounter it is deeply restrictive – despite claims to the contrary, not everyone gets a voice. Thus, we also have counter-publics – smaller communities where those who are blocked from the mainstream can engage safely and fully in the sort of discussions Habermas envisions. The counter-publics can and do influence the mainstream, but they are constantly pushed to the fringes by a society which doesn’t want them. These critiques of deliberation also point to a deeper challenge: dialogue only works when all parties are willing to enter and participate in good faith. You can’t engage in dialogue with someone who wants to destroy you. This concern is never satisfactorily addressed by Dewey or by Habermas. They both engage deeply with questions of manipulation, force, and instrumental action, but they seem content to believe that such problems can be dealt with effectively and are not too deeply interwoven into our social fabric. A skeptic would argue that these concerns point to a sizable gap in their philosophy – if dialogue only works in ideal conditions, then dialogue necessarily cannot be enough. In the face of racist, anti-semitic, and other harshly vitriolic rhetoric, other tactics are necessary. Dialogue could never be enough. I imagine Dewey wouldn’t give up on his Great Community so easily, though. Perhaps he under appreciated the danger of hate groups, but he would have believed in humanity’s ability to navigate these waters. He would have believed that even the worst among us could learn to participate thoughtfully in productive dialogue. Dewey’s vision seems impossibly far off these days. Few, if any of use, seem prepared to be citizens capable of constructing the Great Community. There are good reasons by skeptical of his claims. But I’m not ready to give up on dialogue just yet, and here I think is where a network perspective can be valuable. As long as we have connections between all elements of our communities, dialogue may be possible. Perhaps every person cannot – and should not, for their own self-care – engage in dialogue with every other person. But if allies serve as the bridges, if those positioned to do have the difficult conversations with the hate-filled fringe, if we truly believe that no one is born to hate, perhaps then we could build the Great Community and, inch by inch, bend the moral arc of the universe towards justice. This entry was posted in Civic Studies, Justice on August 15, 2017 by sshugars. It has been a difficult few days. Following the violent white supremacist rally which took place this weekend, I am angry, heartbroken, ashamed, unsurprised, and resolutely full of an overwhelming sense of love. There is too much hate in this world; I choose love. Indifference is a passive act. It is the quiet comfort of moderates who enable the deep injustices of the status quo with their silence and complicity while patting themselves on the back for staying beyond the messy fray. Indifference is to cede your power, to abdicate your responsibly, to accept things as they are with a half-hearted shrug, but what could I do? Indifference is to give up on love. If we’re being honest with ourselves, the hateful acts our country saw this weekend could have happened in any American city. Our problems are not restricted to a single party, a single region, or a single demographic. The blistering hate we saw on display was merely the articulation of a wound we have collectively let fester far too long. All of us who benefit in some way under the current status quo bear responsibility for these atrocities. We may hate the perpetrators and everything they stand for, but we haven’t done enough to respond. We’ve chosen for too long the smooth path of indifference. It is time to choose love. It is not an easy road. A passionate dedication to the type of love Dr. King espoused requires strength, courage, and heartbreak. There’s a reason civil rights educator and activist Myles Horton titled his autobiography The Long Haul. There is so much work to be done, and on dark days like to today, the entire task can feel hopeless. Love may be right, but it is far easier to settle in to indifference. When confronted with hopeless tasks, I like to remember Camus’ inspired description of Sisyphus, the Greek man mythically condemned to “ceaselessly rolling a rock to the top of a mountain” for all eternity. It is the quintessential futile task. His work will never be accomplished. Yet despite the dreadfulness of his fate, Camus describes Sisyphus as proud and unbroken; despite it all, he is impuissant et révolté (powerless and rebellious). That is how I feel on days like today. There is so much to do, and so little I can hope to accomplish. I am utterly powerless, an insignificant piece in the larger social machine. There is nothing for me but the thankless strain of rolling a boulder, or the foolish optimism of tilting at windmills. The task we face is just too great. Yet, despite this powerlessness, despite my own petty insignificance, I remain steadfastly rebellious. I remain committed to love. This entry was posted in Civic Studies, Justice on August 14, 2017 by sshugars. I will offline tomorrow, attending the Facts/Values/Strategies mini-conference co-hosted by Tufts’ University’s Tisch College of Civic Life and The Good Society, the journal of civic studies for which I serve as an editor. In preparation for this conference, I’ve been reading the conference papers – which each seek to integrate facts, values, and strategies in conceiving of citizen’s roles in civil society. The papers have been engaging and inspiring, and I’m looking forward to a day and a half of dialogue digging into these topics. Current global crises of democracy raise fundamental questions about how citizens can be responsible and effective actors, whether they are combating racism in the United States, protecting human rights in the Middle East, or addressing climate change. If “citizens” are people who strive to leave their communities greater and more beautiful (as in the Athenian citizen’s oath), then their thinking must combine facts, values, and strategies, because all three must influence any wise decision. Mainstream scholarship distinguishes facts, values, and strategies, assigning them to different branches of the academy. Many critics have noted the philosophical shortcomings of the fact/value distinction, but citizens need accounts of how facts, values, and strategies can be recombined, both in theory and in practice. John Dewey, Hannah Arendt, Mahatma Gandhi, Jürgen Habermas, Amartya Sen—and many other theorists of citizenship—have offered such accounts. Actual civic movements also combine facts, values, and strategies in distinctive ways. For instance, the American Civil Rights Movement used the language of prophesy, and Second Wave Feminism strategically advocated new ways of knowing. These papers propose theoretical, methodological, historical, and empirical responses and case-studies related to the question: how should citizens put facts, values, and strategies together? This entry was posted in Civic Studies on May 17, 2017 by sshugars.